The Allcam GSD305H Gas Spring Monitor Stand mounts two LCD/LED monitor on one desk via a desk clamp or grommet (bolt through desk). It is ideal for corporate and professional offices where frequent adjustment of monitor height and position is important. Along with the horizontal extender arms, the GSD305H features gas spring technology, making it possible to change the monitors' heights / positions instantly. Simply use your hand to move the monitors around to the positions you desire and they float there like magic, NO tools required! The additional horizontal arm extensions improve accessibility, giving the GSD305H a max. radius of 44cm (17.3"). If you need a simple solution for your office then look no further. With this dual-monitor stand you can mount two monitors for two different users and each monitor can still be adjusted individually in an instant. 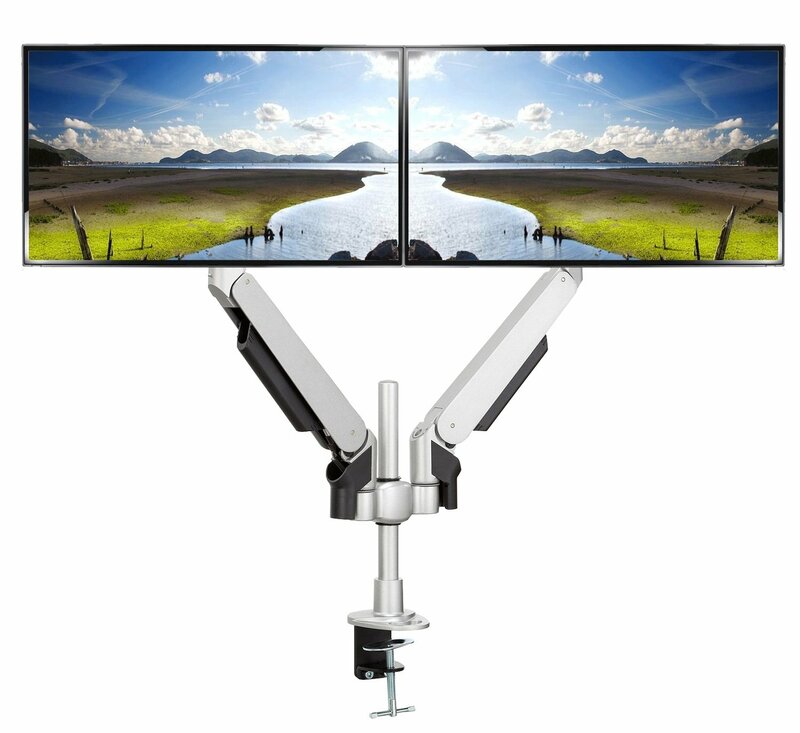 The GSD305H monitor arm stand is compatible with LCD/LED monitors which weigh between 1.7 and 5 Kgs (3.7 to 11 lbs) and have VESA 75 or 100 mounting holes at the back, roughly 99% of all the 17" to 27" monitors satisfy both requirements. The Allcam gas spring series of monitor stand is similar to the Ergotron LX and MX premium series' of monitor mounts but only half the cost, and much easier to assemble; anyone with a little DIY experience can mount a monitor in 5 mins instead of the 30 mins needed for Ergotron stands. Concerned with the quality? Allcam has 10 years experience in designing TV/monitor stands, we are so confident with the quality of our products we provide 5 years warranty on all our monitor stands. Gas spring technology is well established. Car enthusiasts are familiar with its applications, notably the mechanism which supports the opening/closing of hatchback doors. Allcam GS series monitor stands are designed with gas spring technology placed in the action arm. This allows you to adjust the arm smoothly when needed, yet keeps your monitor in the desired position. The gas spring assisted arms are rated for different weight ranges, for example, "1.5 to 6 kg", to ensure there is a proper counterbalancing. These GSD305H dual LCD monitor stands come brand new in a sealed box, with 5 years warranty.